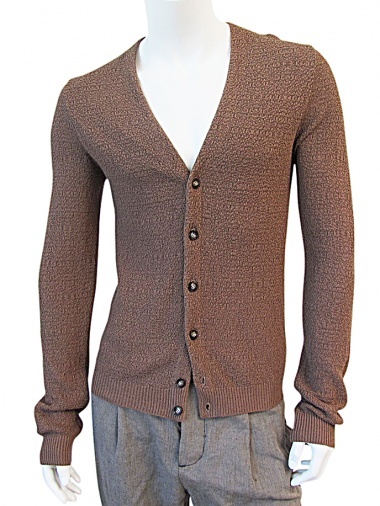 Rice-stitch Cardigan 60% Paper 40% Cotton by Nicolas & Mark - Clothing Men Knitwear On Sale. Brown paper and cotton V-neck cardigan, without lapels, Union Knopf buttons fastening, Eco fashion vision, slim fit, "half-palm" long sleeves. The particulary is given by the rice-stitch that makes more material to the touch and sight, ribbed tissue in the bottom and sleeves.